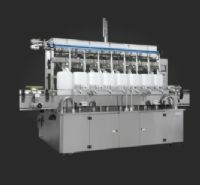 This machine is designed for filling big ( 5 Liter ~ 20 Liter) volume container. -Machine main construction covered by SUS#304. -Conveyor driven by variable speed AC Motor (Siemens brand) with Italian gear box. -Digital scales and fast-fill / slow-flow to achieve to high accuracy of target fill weight. -Electronic load cells with digital indicators. -Mitsubishi PLC control system with digital LCD touch screen display. -Digital filling weight setting for each filling head. -No bottle - no filling safety device. -one air compressor with dryer is required to be prepared by buyer. -Photocell sensor ( Germany , SICK brand ).